hopefulimagination: The cost and consequence of love on a divine scale. The Master of the Embroidered Foliage is not a person, more probably a school of painters working around the 1480's. There are several paintings of the Madonna and Child, each with the background foliage painted to resemble textile embroidery. More than five centuries on, the painting remains a masterpiece, but one much less accessible to a digital age more used to image, movement and sound, controlled by sophisticated technology. Less compelling too, for a culture in which entertainment ranges from fantasy to soap opera, from horror to stylised violence, and from reality TV ( which bears little relation to real reality) to 24 Hour News with saturation coverage of the daily narrative of our troubled world. Which brings me to Advent, and the power of this time of promised change and imaginative hope to call us in question. Good liturgy always does that, calls us in question. The importance of paintings such as this, if we are ready to pay attention to them, is the capacity of unfamiliar beauty to subvert the contentment that constrains our imagination and to interrogate the unexamined assumptions that shore up our contemporary complacency about our own importance. We've become accustomed to the self-description, "21st Century People", and the subtle way such discourse relegates previous centuries to "then", which is always inferior to "now". The subject of the painting is a mother and child...."for unto us a child is born, to us a son is given." 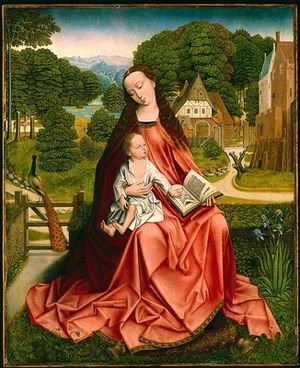 The open Bible, central to the image, is the Word interpreted by the Word made flesh, the child not content with a single text is turning the pages of Scripture, the mother looking down with puzzled adoration, the child looking into the distance. The red robe is redolent of redemptive love, the green foliage a richly woven texture of a living world, behind the Madonna's shoulder the church and the town buildings, the holy and the secular together. And of course the peacock, ancient symbol of resurrection and new beginning, stands at the gate looking down the unseen road. This is an Advent painting. But its message isn't cleverly communicated with digitally mastered precision. The precision is not technological but theological, and the message is neither for entertainment nor information, but is transformative of human hopefulness and draws us back towards God, our hearts once again bright with future possibility. Of course you can dismiss such a painting as 15th Century late medieval devotional piety that dissolves under the scrutiny of 21st century media savvy minds like our own. But that would be a mistake. I mentioned the puzzled adoration on the Madonna's face. Again and again she is portrayed by the great artists as one who smiles, but whose smile is quizzical, or hesitant, or even sad. Mary Oliver has a three line poem that explains what might lie behind such a smile. We shake with joy we shake with grief. Advent shares that same oscillation of joy and grief, the cost and consequence of love on a divine scale.